Papua New Guinea occupies the eastern half of the rugged tropical island of New Guinea(which it shares with the Indonesian territory of Irian Jaya) as well as numerous smaller islands and atolls in the Pacific. The central part of the island rises into a wide ridge of mountains known as the Highlands, a territory that is so densely forested and topographically forbidding that the island’s local peoples remained isolated from each other for millennia. The coastline is liberally endowed with spectacular coral reefs, giving the country an international reputation for scuba diving. The smaller island groups of Papua New Guinea include the Bismarck Archipelago, New Britain, New Ireland and the North Solomons. Some of these islands are volcanic, with dramatic mountain ranges, and all are relatively undeveloped. Nearly 85 percent of the main island is carpeted with tropical rain forest, containing vegetation that is a combination of Asian and Australian species. The country is also home to an impressive variety of exotic birds, including virtually all of the known species of birds of paradise, and it is blessed with more kinds of orchids than any other country. Papua New Guinea’s climate is tropical, as one would expect in a country located just south of the Equator. December to March is the wet season, although occasional rain falls year-round. While Port Moresby, the capital, and other towns on the coast are quite hot in the summer months, temperatures are considerable cooler in the Highlands. July, August, and September are the best months for trekking vacations. Absolutely gorgeaous photographs! 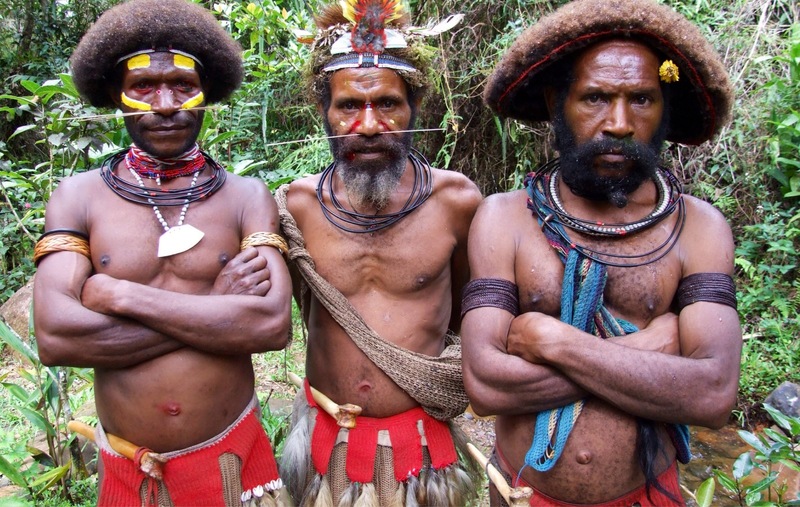 We never made it to Papua New Guinea when we were sailing and always regretted it. But your photos do bring back memories of sailing the S. Pacific. I will be bowsing your site for more lovely photos and to bring back memories of our travels. We spent 6 1/2 years at sea, with two kids no less. Made it all the way around. Best thing we ever did. Breathtaking photos! The second one is incredible, with the motion of the rower like that and capturing underwater as well.